The Dodge Charger epitomizes the resurgence of unbridled American muscle. 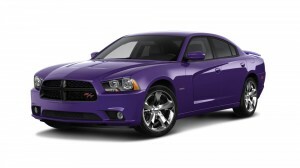 The 2014 Dodge Charger flaunts one of the most outwardly aggressive exterior designs in the industry. From its imposing front grille to its signature rear-stretching LED taillights and standard 17-inch alloy wheel, the 2014 Charger boasts unrivaled curb appeal. So the 2014 Charger looks tough, but is it? Without question. The base 3.6-liter V6 generates 292 horsepower and 260 lb-ft of torque, and the exhaust enhancements in the Rallye Appearance Group, Blacktop, and Redline packages boost that output to 300 horsepower and 264 lb-ft of torque, but that’s just the beginning. The 2014 Charger R/T is powered by a 5.7-liter V8 that produces 370 horsepower and 395 lb-ft of torque, and the elite 2014 Charger SRT8 pumps out 470 horsepower and 470 lb-ft of torque thanks to 6.4-liter V8, which propels the 2014 Charger from 0-60 mph in just 4.6 seconds. The output monster that is the 2014 Dodge Charger is surprisingly fuel-efficient. The base V6 tops the powertrain offerings at 19 mpg city and 31 mpg highway when equipped with the eight-speed automatic. The high-performing 5.7-liter and 6.4-liter V8’s return a combined fuel economy rating of 19 mpg and 17 mpg respectively. In addition to boasting one of the most spacious interiors in its class, the 2014 Dodge Charger is also loaded with technology, including an available 8.4-inch touchscreen interface (4.3-inch standard), 19-speaker Harman Kardon audio system, and navigation. Government crash-testing awarded the 2014 Dodge Charger a five-star rating in overall protection thanks to a slew of standard features, including stability and traction control, antilock disc brakes, and an advanced airbag system. A rearview camera, blind-spot monitoring system, forward collision warning, rear cross-traffic alert, and adaptive cruise control are also available.